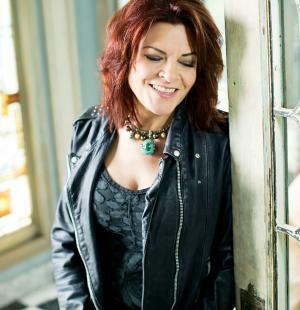 Rosanne Cash was born on 24th May 1955, in Memphis, Tennessee USA, and is a singer, songwriter and also an author, but perhaps best known to the world for being the daughter of country music legend Johnny Cash. However, she has managed to step out of her father`s spotlight, and release 13 studio albums so far, including Seven Year Ache” (1982), and “King`s Record Shop” (1987), both of which achieved gold status. Have you ever wondered how rich Rosanne Cash is, as of early 2017? According to authoritative sources, it has been estimated that Rosanne`s net worth is as high as $10 million, earned largely through her successful career as a musician. Apart from her solo career, she has also collaborated with numerous musicians, including her father, then Bruce Springsteen, Vince Gill, Rodney Crowell and many others, which has also improved her wealth. As mentioned, Rosanne is the daughter of famous country singer Jonny Cash, and his first wife, Vivian, and has three sisters, Kathy, Cindy and Tara, all of whom were raised by their mother in California once the Cash couple divorced in 1966. Young Rosanne went to St. Bonaventure High School, but following her matriculation she joined her father on tour, and stayed with him for more than two and a half years. In the beginning she only worked as wardrobe assistant, but as her courage and ability grew, she began to perform on stage, firstly with her father and then as a solo act. She was first introduced into the studio in 1974, when she sang the song “Broken Freedom Song”, used for Johnny Cash`s album “The Junkie and the Juicehead Minus Me”. Two years later she was the composer on the song “Love Has Lost Again”, which can be found on Johnny`s album “One Piece At A Time” (1976), and that year she found a job at CBS records in London, but instead of pursuing her career, Rosanne returned to Nashville and enrolled at Vanderbilt University to study English and drama. After that, she moved to Los Angeles, and enrolled at the Lee Strasberg Theatre Institute in Hollywood. In 1978 out came her first full-length, self-titled album, but the album was it was never released in USA, as it was recorded in Munich, Germany, and was released by German record label Ariola. Nevertheless, she signed a record deal with Columbia records, and in 1980 she released her second album – “Right or Wrong” – which reached No. 42 on the US Country chart, and announced Rosanne as a new upcoming act. Just a year later she released her third album and proved that third time is the charm, as her album “Seven Year Ache” topped the US Country chart and achieved platinum status, and spawned hits such as “My Baby Thinks He`s a Train” and “Blue Moon with Heartache”, which only made her more popular. Rosanne continued successfully during the ‘80s, releasing such albums as “Somewhere in the Stars” (1982), which reached No. 6 on the US Country chart, then “Rhythm & Romance”, which became her second album to top the charts, followed by “King`s Record Shop”, which achieved gold status, increasing Rosanne`s net worth to a large degree. Her next album called “Interiors” was released in 1990, which she produced herself and wrote most of the songs; the album reached No. 23 on the US Country chart, and received positive reviews. However, her popularity began to decline, and her next albums “The Wheel” (1993), and “10 Song Demo” (1996), didn`t chart to the level of her previous albums. Nevertheless, she returned through the big door in the early 2000s when she released the album “Rules of Travel”, which spawned the hit song “September When It Comes”, featuring Johnny Cash, one of the last songs he finished before his death. Her next album came out in 2006, entitled “Black Cadilac”, and she has recorded and released two more albums “The List” (2009), which peaked at No. 5 on the US Country chart and No. 2 on the US Rock chart, and “The River & the Thread” (2014), which reached No. 2 on the US Country chart and became her best charting album on the US Billboard 200, landing at No. 11. The album won her three Grammy Awards, in the categories of Best American Roots Song and Best American Roots Performance, plus Best Americana Album. Furthermore, in 2015 she was inducted into the Nashville Songwriters Hall of Fame. Regarding her personal life, Rosanne has been married to John Leventhal, who is also a musician, since 1995; the couple has a son together. Previously, she was married to singer and songwriter Rodney Crowell from 1979 until 1992; they had three daughters. Back in 2007, she had problems with her health, and went through brain surgery as she was suffering from Chiari Malformation Type I. She recovered by the end of 2008, and managed to continue working on her music. Rosanne is a well-known philanthropist, as she has worked with numerous charity organizations, including Center To Prevent Youth Violence (CPYV), Children, Incorporated, and many others. 1 [on her father] He didn't love the business. he loved the music, and he loved being a writer and performer, but the business kind of irked him and he got into plenty of conflict. You take for granted anything your parents do when you are a kid, Later on when I became a songwriter myself, I appreciated just how rare what he did was. [His advice was] take care of your family first. Saying no is very powerful.. I hope I've refined what I do. I've worked on my skills and the quality of songs I can catch. I think I've strengthened my work ethic. 2 On change: The key to change is to let go of fear. 1 Her music career began shortly after finishing high school. When she told her father she would like to become a musician, he took her on tour and gave her a list of one-hundred essential songs she should know. It later became the subject of her album 'The List'. 3 In 1981 her hit song "Seven Year Ache" did not, as many expected it to, win a Grammy for Best Song. In 1985 she wrote "I Don't Know Why You Don't Want Me", about not winning the Grammy. The song won a Grammy. 4 Set to have brain surgery for Arnold-Chiari malformation, a rare but benign condition, at the New York Presbyterian Hospital [November 6, 2007]. 5 She is of Scottish and Italian heritage. 6 Her and Jimmy Tittle's composition "On the Surface" was recorded by Bettye LaVette on Lavette's 2005 CD, "I've Got My Own Hell to Raise" (Anti). Cash's original recording appears on her 1990 CD, "Interiors" (Sony). 7 Children: Caitlin Rivers Crowell (born in 1980), Chelsea Jane Crowell (born in 1982), Carrie Kathleen Crowell (born in 1988), Jakob William Leventhal (born in 1999). 9 Cousin of Kelly Cash. 10 Niece of Tommy Cash. 11 Older half-sister of John Carter Cash. Older stepsister of Carlene Carter and Rosey Nix Adams. 12 Older sister of Tara Cash, Cindy Cash and Kathy Cash. 14 Daughter of Johnny Cash and Vivian Liberto. Big Stone Gap 2014 performer: "Seven Year Ache" / writer: "Seven Year Ache"
The Little Rascals 1994 performer: "LOVE HAS NO PRIDE"
Texasville 1990 performer: "Seven Year Ache", "No Memories Hanging Round" / writer: "Seven Year Ache"
Doctor Duck's Super Secret All-Purpose Sauce 1986 Video music: "I Don't Know Why You Don't Want Me" / writer: "I Don't Know Why You Don't Want Me"